You are here: Home » MEDIA » Books » Jacaranda by Cherie Priest (book review). Jacaranda by Cherie Priest (book review). 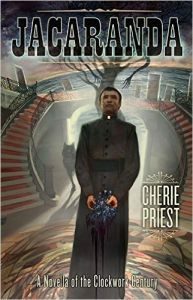 I’ve been a fan of Cherie Priest’s ‘Clockwork Century’ books since I was first captivated by ‘Boneshaker’. Although ‘Fiddlehead’ was announced to be the last ‘Clockwork Century’ novel, we’ve been given the bonus of a novella in the form of ‘Jacaranda’ to assuage the withdrawal symptoms. Like all of the other books, there is a shared background and some mention of events from the rest of the series as well as a cross-over of characters, but each book can be read independently and in any order. ‘Jacaranda’ sees the return of Texas Ranger Horatio Korman as we journey back into the alternative wild west of steam-powered technology, a civil war that went on far too long, drug-induced zombies and marvels of technology from ahead of their time. The title refers to the Jacaranda Hotel, on the island of Galveston off the coast of Texas, a place of mysterious and violent deaths, a dark history and strangely uncommunicative guests. The plot revolves around three main characters who are attempting to get to the bottom of the strange happenings. Sister Eileen Callahan is a nun and possibly more, who has been at the hotel for a while and calls in help from two sources. Father Juan Miguel Quintero Rios is a padre with his own dark past and unorthodox skills who has experience of the inexplicable. Ranger Horatio Korman, if you’ve read the previous books, has been involved in plenty of wild and dangerous adventures and he alludes to more on his arrival at the hotel. All three are fascinating characters with their own secrets and strengths and all are brought vividly to life within a paragraph of their introductions. The whole tale is very atmospheric, with the hotel’s tragic past providing the backdrop and a hurricane brewing on the horizon to add to the tension. Quite why anybody is still staying or working at the hotel following several gruesome deaths is part of the mystery that the investigators struggle to come to terms with. Despite sharing the steampunk background as the rest of the books, this is more of a tale of horror. There is little of the wild west and airships, but there is darkness and gloom, mystery and drama. I don’t read horror in general and, when I have come across the odd horror story in a mixed genre magazine or anthology, I’m always left with a sense of dissatisfaction. In Science Fiction, the author generally works hard to ensure that however fantastic the events or settings there is a plausible explanation and basis for events. This seems not to be a requirement for horror, as long as there is an air of mystery and chill. It’s a well-written book and the characters are brilliant, but I was left with that same feeling of the unexplained. Perhaps that’s what horror fans like. Cherie Priest certainly ramps up the tension with this one and draws out the mystery in the close and oppressive confines of the Jacaranda Hotel. It would be very interesting to know more about the characters introduced in this book and to see them in action again. « The Zombie Times, November 2016 Film Festival Issue (emag review).